Spike Lee has long been on board with Regina King's message. The If Beale Street Could Talk star, who took home her first Golden Globe earlier this month for Best Performance by a Supporting Actress, took a concluding moment during her speech to issue a challenge to anyone listening. "So often, everyone out there, they hear us on the red carpet, and they say celebrities, we're using the time to talk about ourselves when we're on our soapbox and using a moment to talk about the systemic things that are going on in life. Time's Up times two. The reason why we do this is because we understand that our microphones are big and we are speaking for everyone," she said. "And I just want to say that I'm going to use my platform right now to say in the next two years, everything that I produce, I am making a vow—and it's going to be tough—to make sure that everything that I produce, that it's 50 percent women. And I just challenge anyone out there who is in a position of power, not just in our industry, in all industries—I challenge you to challenge yourselves and stand with us in solidarity and do the same." 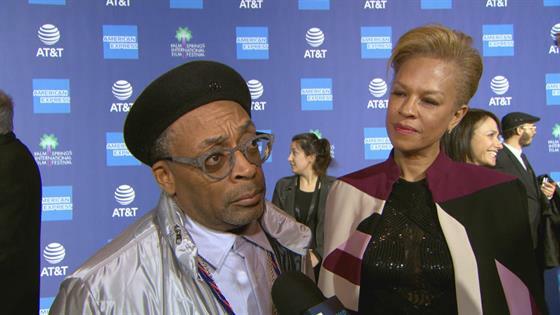 The unforgettable speech was heard by many figures in the industry, including acclaimed director Spike Lee, who was at the ceremony as a nominated Best Director for BlacKkKlansman. According to Page Six, Lee addressed King's challenge during a BlacKkKlansman reception on Wednesday. "I've been hiring women way before Regina made that speech," Lee said at the event, according to the website. "Go back to my crew list...1986, She's Gotta Have It. School Daze—[Black Panther costume designer] Ruth Carter's first job was in School Daze." "I'm not knocking what Regina said," he added, "but I have had very diverse crews since way back in the '80s, so it is not something new to me." Lee previously recalled to E! News how he gave three famous actresses their starts on the big screen. "When it comes to actors, I got spidey sense," he said. "Jungle Fever was Halle Berry's first film, Queen Latifah's first film. Do the Right Thing was Martin Lawrence's first film, Rosie Perez's first film."